My interest in attending this year’s Women’s Leadership Symposium was for both personal and professional reasons; as the mother of a six-year-old, Principal Solicitor at my own immigration law firm and the Managing Director of my own company, I was keen to learn new tips for finding the holy-grail that is the elusive work-life balance. As a seasoned attendee of conferences on business, feminism and leadership, part of me wondered if I would hear anything new at the conference, or whether we would be (yet again) asked the same questions. Fortunately a great number of new topics, ideas and perspectives were introduced and I found myself mesmerized by the discussion. I was scribbling notes furiously. The symposium made me appreciate that the conversation had evolved. There was an acknowledgement of the complexity of the issues facing women in the workforce and a need for them to be considered on multiple levels. Discussion took shape around topics such as: as a society, what do we need to do to facilitate a work-life balance for women, and men? What part should corporations and government play? On an individual level, how can we have a balanced life? We considered how to reach personal goals, whether they were related to time spent with family, time spent facilitating personal growth, re-entering the workforce, helping others or being a catalyst for change. But the biggest question related to the notion that, as women, what are the additional challenges we face with regard to career progression? Each presenter considered issues by telling their story and sharing what motivated and inspired them, how they built resilience and how their journey still continues. Interestingly, despite the differences in personal circumstances, all presenters delivered two universal messages: one was the importance of putting health and well-being first - a lesson that had been learned by some the hard way. The second was that the path to success did not need to be linear and could certainly incorporate failure. It was inspiring to hear each presenter talk, not just about overcoming challenges such as ill health, financial set-backs, personal failures and just plain bad luck, but how these challenges were catalysts for positive change and growth. I was impressed by the diversity of speakers and audience members who were made up of women from a vast cross-section of industries, covering senior executives, elite athletes, students, board members, those working in finance and banking, the not-for-profit sector and government, entrepreneurs, entertainers, media personalities, artists, academics and scientists. You name it. On a purely practical level, it was an incredibly well organised conference. The speakers were engaging and informative, entertaining and moving. The presentations were well paced and just long enough (around thirty-forty minutes). 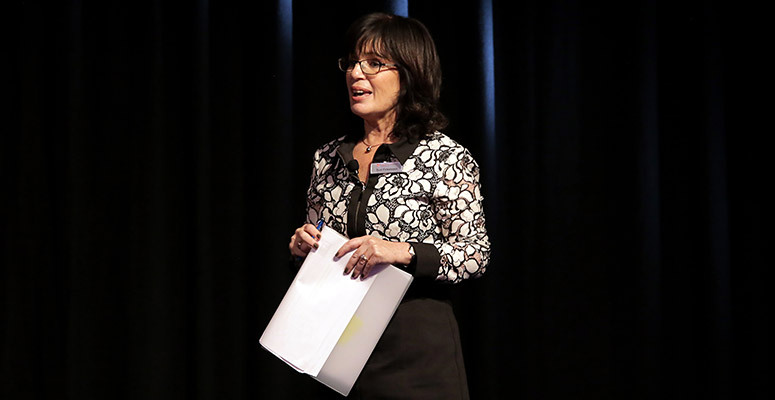 The schedule ran on time and was led by Suzi Finkelstein, a truly impressive communicator and conference facilitator. One of the additional benefits of the symposium was that it provided ample opportunities for participants to mix and converse with each other and the speakers. Unlike some networking events which can be awkward or intimidating, the symposium was more like a relaxed community gathering. Participants were open and friendly, and it was easy to enter into conversations and exchange contact details. Attending this year’s Sydney Women’s Leadership Symposium was a wonderful opportunity. I have already recommended the event to many of my friends, colleagues and professional contacts as being a very worthwhile and beneficial experience and I am already looking forward to attending next year’s event.